Years of patient diplomatic efforts by China with its belligerent neighbor North Korea seemed to be coming to an end on Saturday, following Beijing’s public announcement of an agreement with the U.S. on ridding North Korea of nuclear weapons. The action comes after last Sunday’s early warning shot by China’s President and CCP Secretary General Xi Jinping, in a keynote speech at the Boao Forum for Asia. During the speech, Xi noted, “No one should be allowed to throw a region and even the whole world into chaos for selfish gains.” These latest comments from Beijing are particularly significant, as China is North Korea’s only major ally and has long subsidized the regime’s existence as a buffer state through large amounts of fuel and food aid. Beijing’s latest action comes in response to the most recent round of threats to the region, warning foreigners to leave South Korea due to an impending “thermonuclear” war, with claims that it had “powerful striking means” on standby for a launch. According to the latest intelligence from Seoul and Washington, North Korea has positioned as many as five medium-range missiles on its east coast, possibly in readiness for a test launch of its Musudan medium-range missile. A new American intelligence analysis, disclosed Thursday at a hearing on Capitol Hill, says the Defense Intelligence Agency (or DIA, the Pentagon’s intelligence wing) has “moderate confidence” that North Korea has nuclear weapons capable of delivery by ballistic missiles, but that the weapon was unreliable. With a potential range of 2,180 miles, North Korea’s Musudan missile reportedly has the potential to hit U.S. bases on Guam (which has been identified as a potential target by North Korea), and although several successful ballistic missile launches have been conducted, it is unknown whether the Musudan can fly that far. Last year, North Korea failed in an attempt to send a satellite into space aboard a long-range rocket. North Korea has also barred its South Korean workers from entering the Kaesong Industrial Region, which generates $2 billion a year in trade. Many analysts have downplayed the threats coming from North Korea as the typical rhetoric emanating from Pyongyang at this time of year. The nations’ biggest holiday, the birthday of North Korea founder Kim Il Sung, is celebrated on April 15, and this week marked the anniversary of leader Kim Jong Un’s appointment to the country’s top party post. Some analysts estimate that the 30-year old Kim is driving the rhetoric given his need to establish himself as a strong leader before his comrades and people. Others are not so sure, including North Korea’s neighbors. Seoul has deployed three naval destroyers, an early warning surveillance aircraft and a land-based radar system, and Japan has deployed PAC-3 missile interceptors around Tokyo. 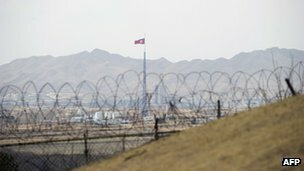 The U.S. forces in the region are also reportedly on high alert and prepared to intervene, “We have every capacity to deal with any action that North Korea would take, to protect this country and the interests of this country and our allies,” U.S. Defense Secretary Chuck Hagel recently told reporters at the Pentagon. The U.S. Navy has moved two missile defense ships closer to the coast of the Korean peninsula, and the Pentagon announced it will place a more advanced land-based missile defense on Guam. The Pentagon has also moved a sea-based X-band radar, designed to track warheads in flight, into position in the Pacific. Naturally, China would like the problem settled peacefully, with tensions relaxed on all sides and a renewed dialogue among North Korea’s neighbors, and perhaps this will be the end result once again. Pyongyang’s strategy has long been to escalate tensions in order extract concessions, in other words, to be rewarded for bad behavior. But this strategy is becoming increasingly tired and should be called into question. Regardless of whether Pyongyang’s latest provocative boasts are the new leader’s establishment of his authority, playing to a domestic audience or whether the missiles are actually fired, Beijing has long needed to discover a new approach to dealing with its neighbor. Acknowledging North Korea’s nuclear weapon potential and seeking to curb their progress in developing these weapons is a first step. But how Beijing decides to play their cards and apply pressure to rid North Korea of its weapons is unclear. Withholding economic and food aid is one of their strongest hands, but could easily exacerbate the situation and cause a humanitarian crisis, with the potential flood of refugees into China. Refugees have long wandered back and forth between China and Korea. From 1865 the Qing dynasty officially allowed Koreans to live and farm in Manchuria. In 1920, the number of those migrating from Korea into China surpassed 450,000, most of which were escaping poverty and Imperial Japan’s attempts at smothering Korean culture. By 1945, the number of Korean migrants in China totaled 2.1 million, and in 1952 China established the Yanbian Autonomous Prefecture, which is now home to over 800,000 ethnic Koreans. Nowadays, there is an established underground network of South Korean churches and non-governmental organizations which shuttles refugees from China to South Korea — tens of thousands of North Koreans have fled since the famine of the mid-1990s. Some activists estimate that between 30,000 and 40,000 North Korean refugees are living in China, procuring food for their relatives or waiting for a chance to escape to Laos or Thailand, where the South Korean authorities are able to help. These networks could be further strengthened through additional multilateral assistance and funding. Of course, Beijing is worried of a humanitarian crisis developing on its territory should the floodgates open for a potential 24 million North Koreans – but it is unlikely an overwhelming number of refugees could escape. Whether or not Beijing decides to play this hand, its policies toward North Korean refugees should be loosened – many who do manage to escape are hunted in China, and once discovered, taken back to North Korea where they may be tortured and jailed. Whether or not loosening the border controls has any impact on preventing further rounds of tension, it should be undertaken by Beijing as a purely humanitarian gesture.